Traffic controllers KOMKON-KDK-06 are the further development of the family of controllers KDK, including the most advanced circuit design and software solutions. Controllers can be managed from a control centre or from the controller-coordinator. keep an archive of its actions with the possibility of extracting information when considering disputes. additional circuit breakers, sockets and interior cabinet light for operational use by the staff. two UART with data rates up to 3.6 Mbit/s (one of them can support serial communication with RS- 485). connection of CITILOG XCam detectors via Ethernet. Controller is designed to work in an industrial temperature range from -45 °C to +85 °C, the operating system is Linux. Programming of the controller to operate on the specified programs in local mode is performed using a standard modules of flash-memory, connected to USB, or remotely via Ethernet. The number of outputs control units can vary from one to eight depending on the customer needs. Each output unit is an intelligent and can be programmed to control signals for red, green or yellow colors in any combination. Availability of voltage and current control schemes allows avoid accidents during red signals failures (controller switches to YF) and at the simuletenous switching of green signals in conflict directions (controller shuts signal heads down), as well as to determine the amount of blown-off emitting elements for each signal. There is a LED indication, showing the state of the controller and periphery. There is a possibility for communication modems installation with radio or wire (START, V- 23) interfaces. 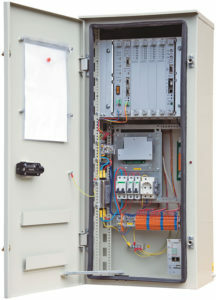 The controller can be connected with speed monitoring devices, traffic sensors (cameras, infrared, radar, ultrasonic detectors with relay, Ethernet or RS485 outputs). The software is operating on operating system Linux BSP based on kernel 2.6.32 and enables adaptive traffic control as in local mode, and as part of Urban Traffic Control system.